I have so many to be written posts and I even plan some more for Ramadhan but alas I am writing this right now. Just because I did the curator work early May and it is June already thus the time gap is quite big and I don't want to enlarge it anymore. During curating twt_buku, I asked for some local books (by indie publishers) suggestions as I want to explore more pieces from Malaysia. The #1 rise of many indie publishers with even #2 more exciting genre offered as well as #3 refreshing writing style, I guess it is time for me to try and read more local books. 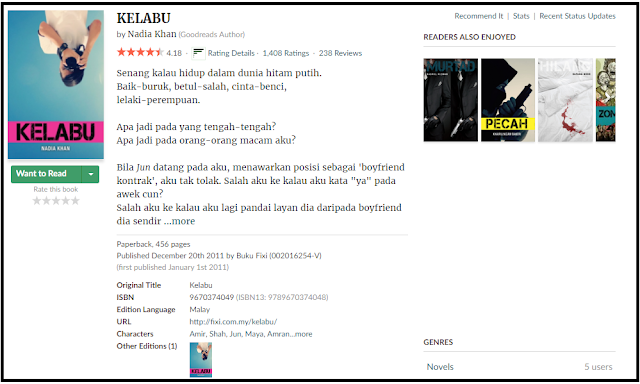 My experience with local books are mostly those cringy love stories which dated way back during my high school. I didn't read many local books since then. To be fair, I don't really read that many books. Oh well. 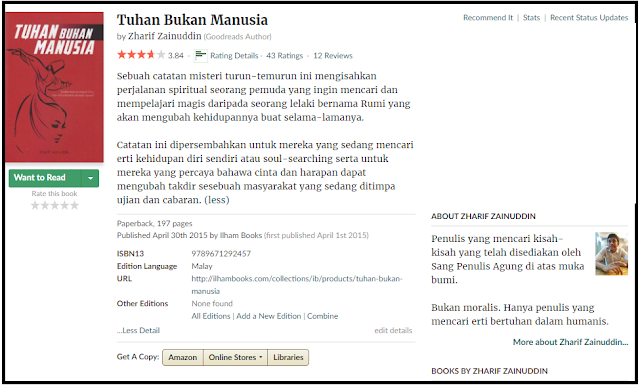 I do want to read more local books especially those in Bahasa Malaysia. Kinda like getting in touch with my roots and effortlessly and genuinely understand it since it is my mother tongue. I rechecked the books via Goodreads and I gotta tell you that I am so damn excited to read some of these. Well, as soon as I finished those that I have right now but still, the books looks so promising! This was suggested when I told that I want to read a poetry book. I didn't know at the time it was from Wani Ardy. When I realised it was written by her, I knew that I have to try it. I have been following some social medias accounts regarding poetry in Malaysia and the name Wani Ardy always mentioned so heck yeah. I wonder if the book has any connection whatsoever to Vanilla Sky movie? The book's author was mentioned in the tweet and he has been so kind to give me the link to read the first chapter for free. I read about 2 to 3 pages and was immediately hooked. The mysterious storyline, as well as the thriller ambience, really attracts me. I think I might have a new favourite genre. The suspense vibe of a thriller genre looks so fun to read. Looking into Ilusaniti gave me a good standard as a benchmark. 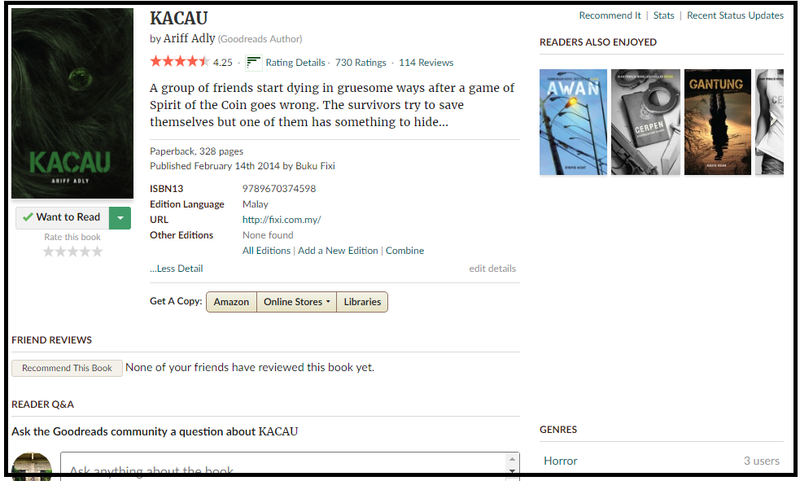 Since I think I'm gonna love thriller, I guess horror will just come naturally lah kan? Hence the reason why I want this book. 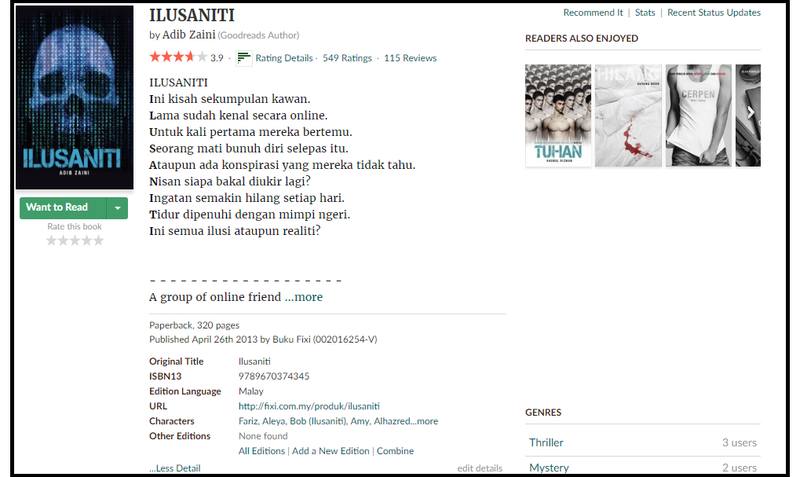 It rated higher than Ilusaniti and we got supernatural agenda too. I love supernatural! Yes, the tv series as well, but that is just because I love supernaturally themed storyline and not because the actors are hot. This one, however, apart from the thriller and horror twist, I am more drawn to the part Rosmah was wearing purdah. Kinda reminds me the movie Munafik which I do like. 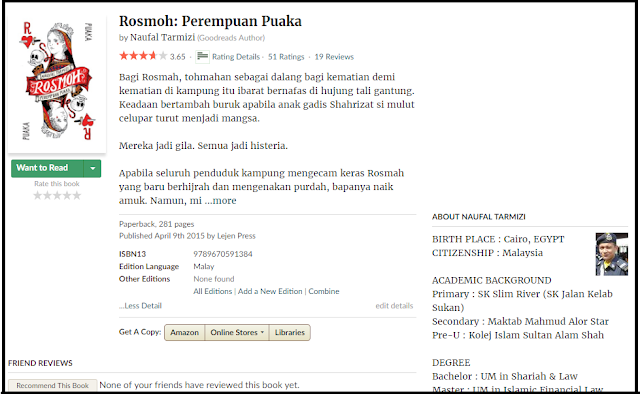 I was also a bit curious by the choice of name - Rosmah? Sounds familiar? Not only that, I am also tempted as the writer's background is quite unique. At first, I wasn't really attracted to this book since I don't want to read another love story. The term "boyfriend kontrak" is such a big turn off too. Yet the reviews that were done promised that it is much more than that. I don't what exactly more means but such pronounce testimony made me change my mind. I actually have another reason. You see, I was raised as a conservative, small town girl and had always been around those like me. 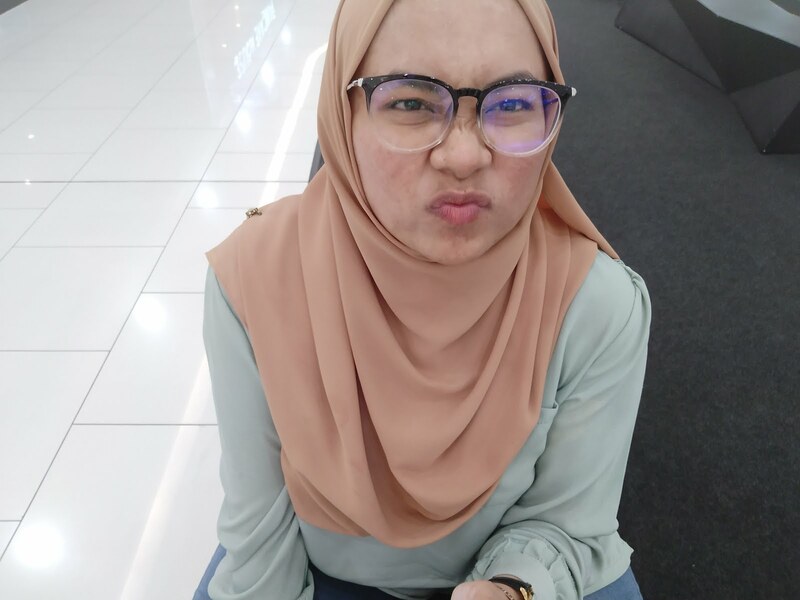 I only befriend one girl who didn't wear tudung and knew some more but just like far acquaintances. I was hoping the book might share bits of those other lives as well. There are literally only two reasons made me want to read this book - the title and the fact that I can learn more about Rumi. I wasn't so big with Teme. I read his blog and his writing wasn't my cup of tea. But this book does attract me a bit because of the synopsis. I mean, just read it and tell me you didn't feel the least bit attracted to know more. OMG, so long ah this post. I've read kacau and kelabu and I could say, Kacau is the best for horror themed.. I read it once and I don't even want to re-read it, simply because I became a scaredy cat for a while.. Maybe it's because I could imagine the story, simply because it stated about an abandoned green shopping mall which I know the building exist, so my imagination went wild.. =="
haha, thats bad. though if I read it, I'll totally Google the mall. 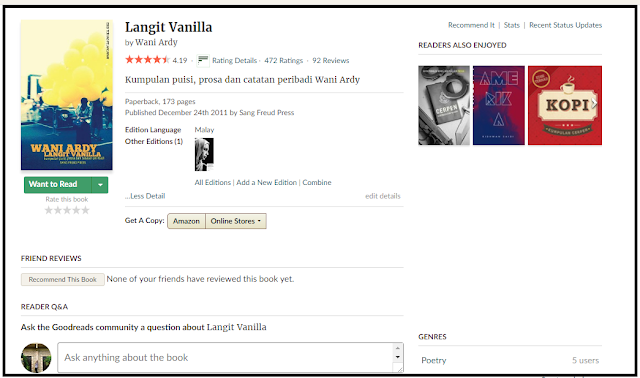 Siqah teringin nak baca Kelabu dan Langit Vanilla. Buku2 daripada Indie Publisher ada dijual kat kedai buku biasa kan? Selalu kat Popular nampak je, tambah-tambah Fixi. Boleh lah tunggu review Siqah utk Arkitek Jalanan. the fact the write named it awek chuck taylor pon dah rasa menarik. takda copyright issue ke? lulz. Now I am more confident to spend money on those! Okay. Kelabu dan Kacau. NOted, boleh beli. Hihi. I don't think I will do any book review in my blog since I'm not really cut for it. But alas, I might still suddenly want to do it so just wait and see. Gotta buy the book first though. As for teme, I've read his blog and pelukis jalanan. His book is okay and I could understand why he is popular among teens. I knew I always say I didn't cut for book review but I have strong belief I'll make an exception for poetry book. Yet again, just wait and see. I agree with your view with Teme, his writing fits those demo so well. 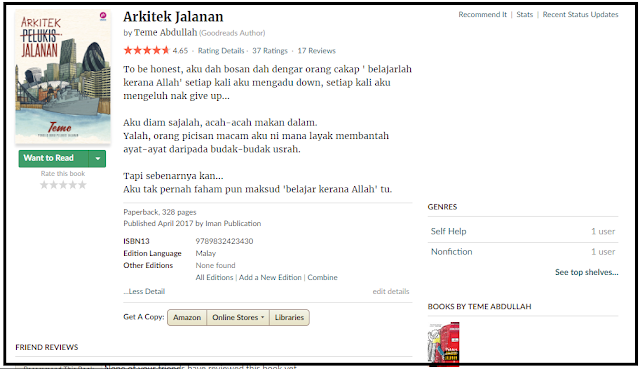 Teringin nak baca semua tu, done bookmark this page. Hihi. Senang nanti nak rujuk.